The weekend of November 20-22 was a weekend full of activities in the Beltway. Five of the members of the Hoosier Review staff left early Friday morning to tour in our nation's capitol. We arrived at Ronald Reagan National Airport around 10 am, and began our day on the DC Metro subway system. Our first stop was the Leadership Institute--the organization which sponsored the conference on Saturday and Sunday. We had an appointment at noon for a personal tour of the capitol with Senator Dan Coat's office. A staff assistant to the senator did an excellent job guiding our group. It was great to see where our nation's laws are passed and what an impressive building it is where our lives are impacted so much. After lunch at DC's Union Station, we wandered over to the Washington Monument to see the Jefferson and Lincoln Memorials. The White House was one of our other stops. 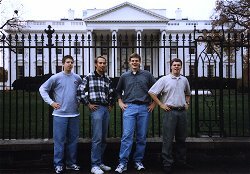 The gentlemen in our group had a rather interesting "photo-op" on Pennsylvania Avenue. Ask them about it, or check back later this week for the photo online! I guess we can't forget the main reason for our trip--the Student Publications School presented by the Leadership Institute. Saturday morning we were up bright and early to head over to the Institute. Breakfast began at 8 o'clock followed by our meetings. We were taught by a number of professionals in the area of journalism. While this is a wonderful on-line publication, our goal is to have a conservative newspaper in print. The point of the Student Publications School was to teach conservative groups interested in starting a publication how to do it. According to its vision statements, "The Leadership Institute's mission is to increase the number and effectiveness of conservative public policy leaders." The Institute was founded in 1979 by Morton Blackwell. Former editors and publishers of independent conservative publications were there to teach on different aspects of publishing. We learned the business, layout, and writing aspects of publishing a conservative newspaper. Saturday was full of these meetings and seminars. Sunday was just the same, but it also featured a special appearance by Morton Blackwell himself--a rare treat for students at the Leadership Institute. Blackwell is famous for his "Foolproof Fundraising" techniques. He was very knowledgeable and really helped the representatives of different universities who attended the school. The Leadership Institute is very dedicated to conservative publications and will help groups with the funding of their first publication, with a grant of $500 to cover the costs. This is very beneficial to conservative groups on liberal campuses. On these campuses many conservative groups are given no funding or a pathetically small amount, like $100. Some universities may not have the funding to support publications, but if they do, they should at least make it fair between liberal and conservative publications. The Institute is truly dedicated to helping these conservative newspapers get started. This was a very productive weekend for our group and it will really help Hoosier Review to turn this on-line "zine" into a printed publication. Scott Tibbs on why the new tobacco settlement is not beneficial.